With orders, you can pay with a credit card over the phone OR choose to receive an invoice by email to pay with a credit card online at PayPal. After payment is received, you'll get the script as a PDF Document by email. PLUS you'll receive lots of extras to help you have the best event possible! You can give winners a small prize such as a magnifying glass. Printable doc with script overviews and Ordering Details. Mystery Dinner Theater programs consistently draw large crowds. Guests sit together at tables where they will eat, enjoy the drama, and then compare notes. Accusations are turned in before the final scene occurs and the guilty party is revealed! Scripts are fun and family friendly. These scripts have been used by youth groups, both novice and experienced drama teams, libraries, hospitals, cheer leading teams, non-profits... Once you have presented your first mystery dinner, guests will be asking when the next one will be!! Countless churches produce Mystery Dinner Theaters as fundraisers to raise funds for missions and other needs! Printable doc with guidelines for hosting a dinner theater. Please read the copyright agreement. Use either web site to find the script that is ideal for your group. The year is 1948. The atmosphere is thrilling and sensational. Penelope Parker presents her final radio show before heading to New York for all new television productions. Yet, not everyone is celebrating. The envy of others at the radio station brings a variety of reactions including resentment, betrayal, deception and thievery. Since there are 2 radio shows within this mystery presentation - over half the script will be read -- Making it much easier to learn lines. Note that preperation time will still be the same because even with reading, practice is needed for learning blocking, working with props, and creating radio sound effects. This is a full length mystery dinner theater script at about an hour. As usual, some fun decorating ideas are included! This is my most popular script. PLUS, it has recently been refreshed with new and fun updates. 1 M or F to be the reporter who solves the crime. Plus fun auditioning opportunities for up to 6 audience members! The audience gets highly involved in this drama because from the beginning they are divided up into 2 teams - Stingrays vs. Starfish! Plus several audience members are chosen to represent their teams up on stage! There are 2 options for endings. One has a strong family message and the other one provides variety. Check out a few pictures! Please read the copyright agreement. A right lively crew heads out west to a real dude ranch. They are seeking to hash out their differences by living a cowboy’s life and reenacting scenes from the Old West. Just as hope appears, several scalawags are caught lyin’ like a rug. One pilgrim retaliates by taking out the worst scoundrel of all. Your audience will enjoy coming dressed western style. Plus other volunteers needed to help with fun sound effects and act as EMT professionals. 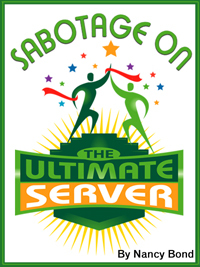 Tonight the TV reality show “The Ultimate Server” begins taping in front of a live audience. Seven contestants will battle to outplay, outperform, and out serve in order to acquire the $250,000 grand prize. After the producer makes a startling revelation, one of the contestants resorts to sabotage. The audience's involvement will be critical not only in participating in the challenges and crowning a winner, but also in helping to find the saboteur! Two endings are provided. Cost: $125 View some pictures! Some of the male roles may be changed to female roles if desired. Check out some pictures from New York Dreams. This script offers a unique option to serve BREAKFAST for dinner. Inexpensive and different Mystery Dinner Theater! Who's cookin' up a scrumptious meal and who's cookin' up a shady scheme to win a charity competition? Be our guest at an elite gala where three celebrity chefs including Patty Deen, Gordy Whimsey, and Rochelle Ray battle to lead their teams to victory. Pairs will fight for votes, but when the coveted grand prize starts slipping away, will the mischief of self-absorbed, win-at-all-costs celebrities bring the evening's events to a halt? Or will the audience help solve the mystery and crown the true victor? This is the shortest of the full length mystery dinner theater scripts at about 55 minutes. Guests are celebrating at a scrumptious, oceanfront luau in picturesque Kona, Hawaii! All week they've explored the amazing island while attending relationship building workshops. But the evening unravels when secret identities, shocking lies, and regretful pasts lead to kidnapping, threats and thievery. Will you be the one to discover the villain and bring resolution? Or will catastrophe and chaos rule the night. The Senior Class at Washington High School is assigned a special Project to agree on a Gift that will be left to the School. Seniors have very different ideas about what this Gift should be! Their interactions among themselves and other students will not only keep the Audience Laughing, but will provide clues to solve the Crime! When graduation day arrives, the Gift is missing!! Audience members will answer: What was the gift? Who took the gift? Why? and Where was it hidden? Bonus -- The Greatest Mystery in History handout comes with every script so the gospel can easily be shared with the crowd. For a FREE preview of any of the scripts -- go to Preview Form. 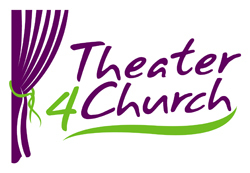 Submit your name and church name along with the name of the script(s) you would like to preview. You will receive three PDF documents: A portion of the script for you to understand the flow, a list of characters for you to determine if you have the right people to fill the cast, and a suggested schedule. TO ORDER: To order a Mystery Dinner Drama Script go to Order Form. You will get an email invoice to pay with a credit card on PayPal or if you prefer - call with your credit card information. Then, after payment is received, you will receive the script as a PDF Document by email. PLUS lots of extras to help you have the best event possible! 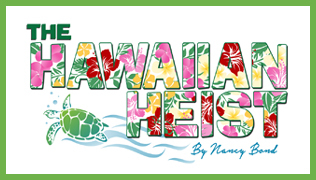 Every script includes: logos, example playbill, table game for audience, set up suggestions, ballots, example ad poster, character descriptions, example handouts for invites, Greatest Mystery Handout,. . .